The Millennium Gloucester Hotel occupies a prime spot in London’s famous Kensington region. 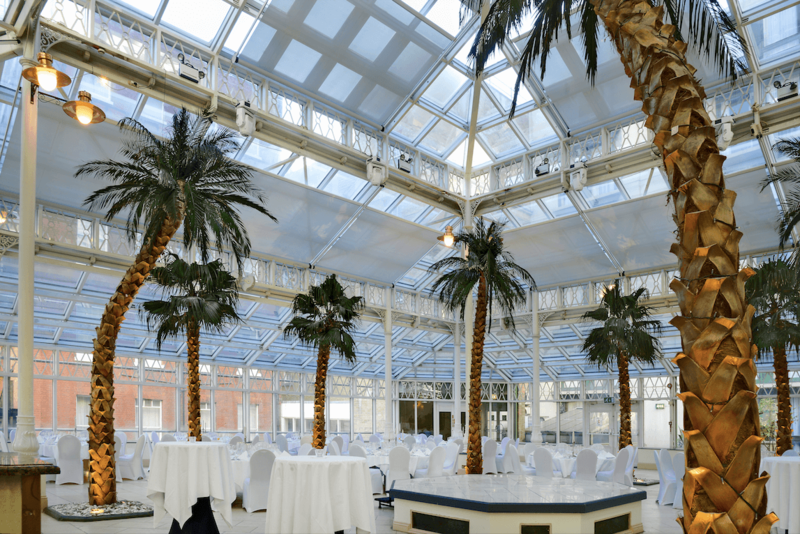 A key feature of the hotel is a stunning glazed roof atrium, over a large open space, designed for large group functions. 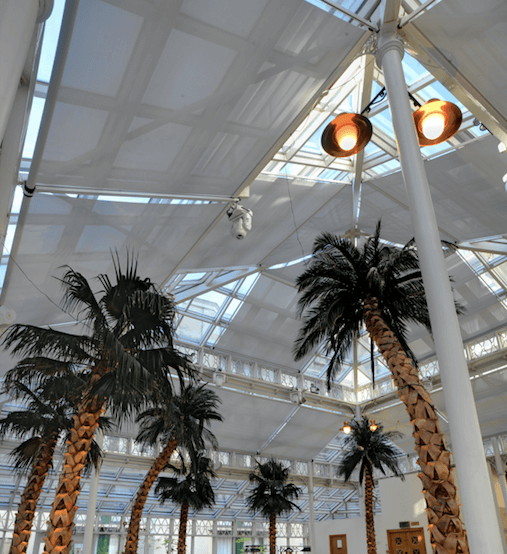 While the replica palm trees give the space a tropical feel, the unshaded fully glazed roof created unmanageable tropical temperatures! Waverley approached Guthrie Douglas to deliver a shading solution to protect against heat and glare, ensuring the comfort of event attendees. The building management also specified the desire to improve environmental credentials. 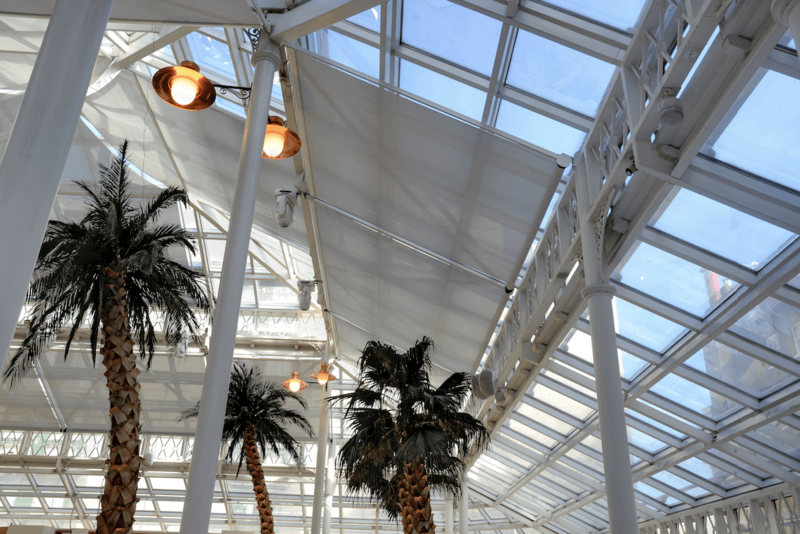 Our TESS™ 120 system was designed for retrofit and for light structures like the hotel’s atrium. With multiple fixing points, it minimises the load imposed on the structure, whilst being robust and durable. A single barrel mechanism keeps the fabric constantly under tension, and provides exceptionally smooth and quiet travel. We manufactured and supplied 16 systems of varying sizes, with the largest 4.125m wide. Our engineers supported the installation on-site, working at height in a fully operational hotel. Mobile scaffold towers were used to gain access to the roof which is over 10m from the floor at the atrium’s highest point. The end result is a discrete but highly effective shading solution which transforms the space by significantly reducing the heat gain and glare, making the space usable in all seasons and weather conditions. Furthermore, energy costs will be reduced throughout the year and the building management are now able to claim energy savings of up to 60 times its CO2 footprint over 20 years. Guthrie Douglas are often invited to consult during the design process to advise on the control of light, heat and glare into a space. Read about our work on a large atrium within an educational facility in the Netherlands.